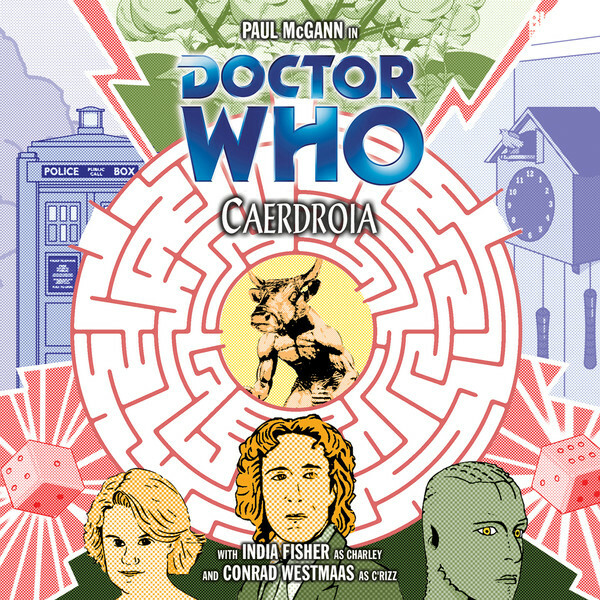 Lloyd Rose finally gets the chance to write for Paul McGann himself after authoring two Eighth Doctor novels, and the resultant ‘Caerdroia’ is superb, finally allowing the Doctor to directly confront the Kro’ka and to discover who gives him his orders while firmly setting events in motion leading into the series finale. The Kro’ka finally becomes the primary antagonist for the first time since his introduction so long ago, and Stephen Perring makes the most of the opportunity. There’s an added dimension to the Kro’ka beyond simply typical malevolance, though, as he is clearly stressed with the need and desire to please his masters. The Doctor, Charley, and C’rizz pick up on this fact quickly and play on his innate fear by criticizing his efficiency and realizing that they cannot be moved between Bortresoye’s zones while the Doctor is asleep. The Doctor threatens to put himself into a trance to effectively stop any progression of the Kro’ka’s plans, realizing that he is now seemingly immune to the Kro’ka’s mental attacks he experienced in ‘The Creed of the Kromon.’ Perring effectively switches from tones of triumph to terror as he subsequently falls into the Doctor’s trap, cornered in his own mind. Even in this time of defeat, he still admires the Doctor and the sacrifices he has made to save others, lending a conciliatory and almost remorseful note to the character. The other aspect that these scenes featuring the Kro’ka hinges on, of course, is the Doctor himself, and Rose captures McGann’s Doctor perfectly. Having the Doctor’s mind full of sideshow amusements is a nice touch and fitting for the character, but the scene in which he threatens to clear parts of the Kro’ka’s memory if he doesn’t help is fantastic. The Kro’ka knows the Doctor well enough now to know that he won’t betray the Kro’ka to his masters, but he is unsure of just how far the Doctor will go in other aspects, making the uncertainty and threat very effective. As whimsical and enjoyable as these portions of the story are, though, ‘Caerdroia’ does present an intriguing progression of the Divergent story arc. With the Divergents running events from the titular planet- itself a Welsh word- imagery from Earth starts populating the story, including ticking clocks despite this being a universe supposedly without time. The story is unafraid to poke fun at typical Doctor Who conventions and even this entire story arc, but the realization that the unending castle they find themselves in is actually the TARDIS is well done. The Kro’ka’s maze creation being misused and himself being a pawn in a more powerful race’s plans is rather less clever, though it does help to explain the character and progress the plot as well. The return of the TARDIS to the Doctor empowers him and gives him a sense of elation and purpose that is refreshing after he reached such an incredibly low point in ‘The Last.’ There’s some great comedy to be had in ‘Caerdroia,’ but very important events unfold beneath the comic overtones, and the Doctor now has the means to prepare for a battle against the Divergents.